Here you will find a trail description, a HIKING MAP and GPS-DATA for DOWNLOAD. Please also take into account our various TIPS AND RULES. People who are heavily drunk and/or excessively loud will not be served. Hen and stag parties are not permitted and groups who appear uniformly* dressed are not welcome (*i.e. discretion should be used to not appear like a rowdy group) . Of course Fünf-Seidla-Steig is marked in both directions – partly with the Frankenweg-sign , so you can start from wherever you wish along the trail. For a transfer back to your starting point there are different possibilities described under GETTING THERE. 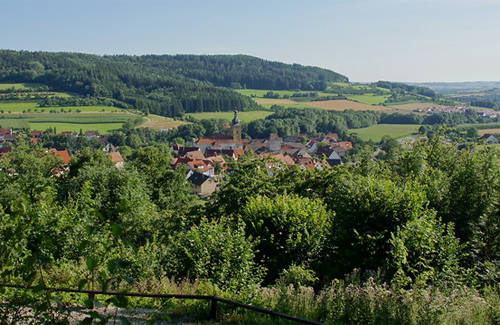 The best starting points according to a required distance or trail details – one-way or circular route – would be the Weißenohe train station, Gräfenberg train station or Thuisbrunn village. At Weißenohe train station the Fünf-Seidla-Steig begins crossing a major road (B2) towards the centre of the village. Here we turn left at the small green traffic island. Entering on your right, the first “Seidla” can be enjoyed in the “Wirtshaus Klosterbrauerei Weißenohe”. After visiting the courtyard of the former monastery we follow the street upwards. The Frankenweg-sign leads us straight ahead across a big junction into “Sollenberger Straße”, and then left along “Gräfenberger Straße” into “Mönchsbergstraße”. We follow the Frankenweg-sign all along the road until the end. Here we leave this sign and keep more to the left, coming along a small track that leads us upward along a beautiful hollow footpath. At the bench we turn half right into the woods and ascend quite steeply, until at the top of the hill we reach the Frankenweg-sign again. It leads straight out to the fields. At a crossing we follow Frankenweg to the left until we come into Gräfenberg via “Sollenberger Straße”. From here we keep on going down until we reach a small passage after 300 m on our left. The steps lead us to the “B2”-junction where we can use the crossing and walk straight on into the town centre. Now it`s getting serious with choices of “Seidla”! 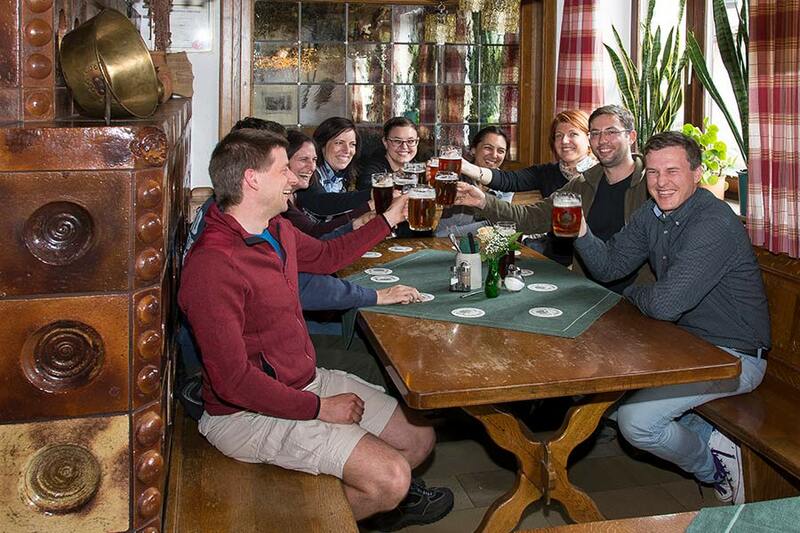 In Gräfenberg for quite a few generations 2 breweries have created beer specialities in their family-run businesses. Even before reaching the town gate to the city centre, a signpost leads us right hand up the far stairs to the beer garden “Biergarten zum Bergschlösschen” run by the “Friedmann” brewery. In fine weather a “must”, otherwise continue to “Friedmann`s Bräustüberl”, situated on the left, still before the town gate. We walk through the gate and reach the Gräfenberg market square with its old townhouses, the “Knight Wirnt Fountain” and the historic town hall. We don`t yet cross the square but continue straight on to the next tarred road “Am Bach” where we turn right. Immediately we come to the brewery guesthouse “Lindenbräu” and maybe enjoy a rest here. Moving further on we have to continue to the next intersection where we turn right, keeping on the right hand side of the sidewalk as we don`t follow the road to the left, but ascend the narrow alley ahead of us. As the alley turns to the left, we again meet the Frankenweg signposts at the far end. In the same direction we meet another lane and follow the signposts until the next crossing where we take the left branch. 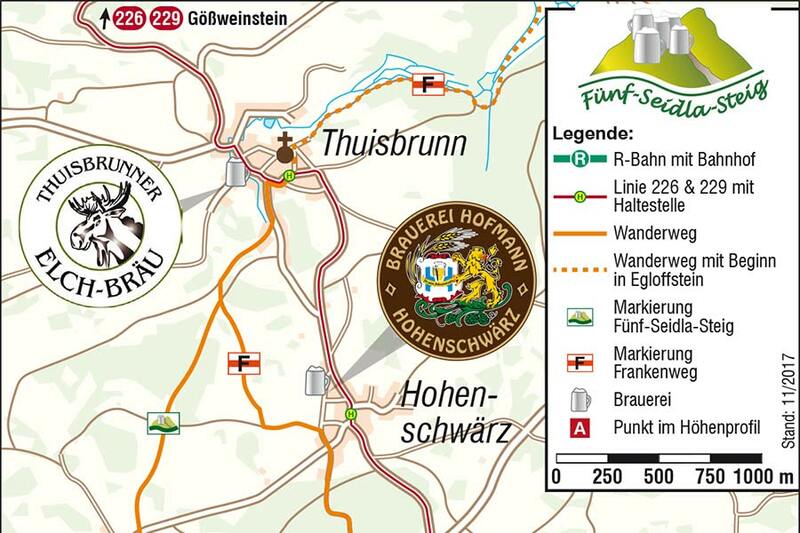 From here the trail is continuously marked with the Frankenweg up to the last brewery inn in Thuisbrunn. We hike on a narrow footpath along the edge of the hills overviewing the Gräfenberg outdoor pool, pass through a piece of woodland, until we reach the road. Here we keep to the right, the track leads us to an underpass. After the small tunnel we immediately turn left keeping the above road prallel on our left. We cross another track and our route leads us right hand upward to a small wood which we pass on the right. We cut across an open field on a grassy path and walk straight into forest. After a short while the bigger path will turn right, this is where we leave it and take a smaller track more to the left. We will head onto a bigger path again and turn left into it. At the hikers` car park with its „Hüllweiher“ (ponds like this were formerly dammed and used to store water on the dry plateaus of this region) already before crossing the road we keep more to the right as we follow the “Frankenweg” through the forest until Hohenschwärz. In the village of Hohenschwärz we cross the road, and after 50 m take a branch to the right, where we are guided right into the tavern of the “Hofmann” brewery – from the back. Cheers! After a refreshment stop we walk back a few meters to the main path and there turn right. A few minutes later we again turn right following the track downward through a beautiful landscape of fields and hedges in the direction for Thuisbrunn. Just ahead of the village we reach a crossing where we have to turn right. We pass the first houses and keep left at the first intersection. Straight ahead we hit into the youngest brewery and the connected inn, “Thuisbrunner Elchbräu – Gasthof Seitz”. If we still want to return by foot our way back is marked as a roundtrail. At first we leave Thuisbrunn on the same way. After passing the last houses we turn left at the crossing but quickly keep right at the beginning of the wood. The alternative round trail via “Neusles” is completely signposted. After having left Neusles we turn left into the forest on a truly wonderful stretch of our hike. We keep on going until the fire station where across the road we meet the original trail again. In Gräfenberg we can again choose stop overs between “Biergarten zum Bergschlösschen”, “Bräustüberl” (Friedmann brewery) or „Brauerei-Gasthof Lindenbräu“. „Bahnhofstraße“ leads us downhill to Gräfenberg train station. There we can take the „Gräfenbergbahn“ train or use the opportunity to continue our way back to Weißenohe. In chosing the latter we follow the track just behind the station and rails – straight on passing meadows and ponds until reaching Weißenohe. At the crossing we once again turn left and will thus reach our starting point.